The iMovie app could possibly be my favorite app on my iPad. It's a versatile app that can lead to a whole lot of creation in your classroom Yes, I know that iMovie on my MacBook Pro has all the bells and whistles, but I believe that the app has all the ingredients to make some pretty powerful products in your classroom. I love the fact that the app allows our students (and us) to make thinking visible. There are so many ways that you can use iMove in the classroom. From knowledge to comprehension, every level of Bloom's taxonomy is easily addressed using the iMovie app. I plan on teaching our K-5 students how to use the iMovie app in the coming weeks and I can't wait to see the creativity that is generated! The best thing about iMovie is that you can use it with a lot of other apps! App Smashing? Try using iMovie as the final app to display your app smash. Just drop your products in from the photo library, do a voice over and you have created a product that allows you to showcase the learning happening in your classroom! Prompterous ($1.99) Planning on doing a newscast or something that would be nice to have a script that was written ahead of time? Purchase this great teleprompter app that has all the goodies (and then some) that you will need. I like the fact this app will allow me to import scripts that I have created in Google Docs! Teleprompter Pro Lite (Free) Very basic teleprompter. This will suffice for most of your student created projects. IntroMate ($2.99) Awesome app! You can easily create professional quality intros and end credits for your movies. They have several templates for you to choose from. Just tap the template you like, edit it as you see fit, save it to your photo library them add to your movie within iMovie. Extras4iMovie ($1.99) I don't use this app enough. You can add scrolling text to your movies, search within the app for HD backgrounds, photos and clip art to use in your movies. Movie Drops ($2.99) I find that the app is a bit pricey for what little it offers, but you get to choose from 24 different HD clips that you can save to your photo library. Simply tap the record button within the app of the scene that you like, record for the amount of time that you want and when you tap the button to stop, the clip automatically drops into your photo library. Intro Designer ($2.99) This app has an awesome collection of beautiful intro movies and credits that you can easily edit for your project. 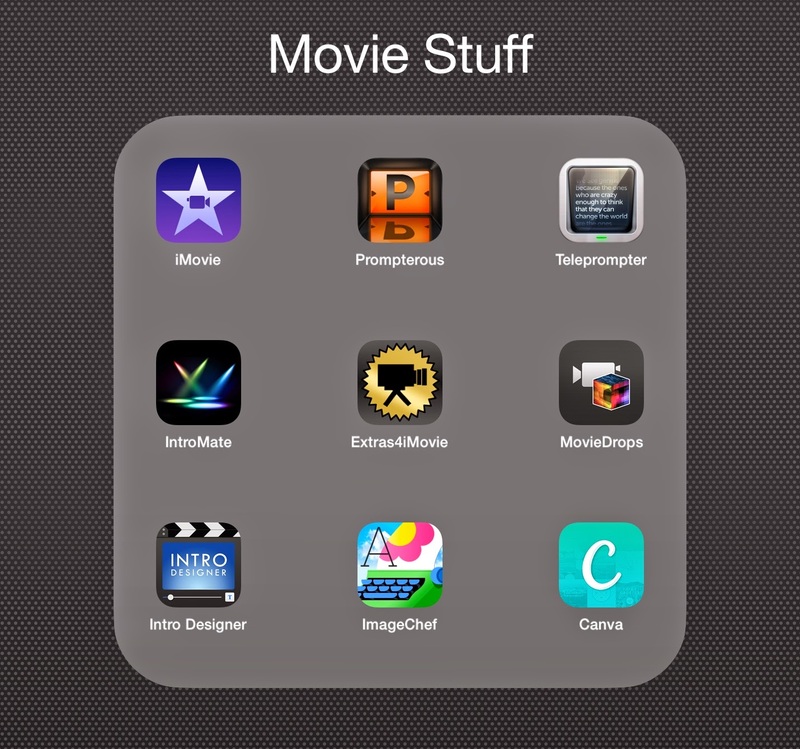 I use this app a lot when creating movies on my iPad. One of my absolute favorites. You can get the Lite version, but there are a lot more options in the paid version. ImageChef (Free) Your creativity explodes when using this app! Take your photos and do all sorts of things with them. When you are done creating, save it to your photo library and add into your project in iMovie. Canva (Free) I love Canva! When it first came out it was only available on the web, but it's now an app and you will LOVE creating all sorts of things with this app. With Canva, you can choose from over a million layouts, stock photographs and illustrations to create some pretty professional looking products. Customize your creations and add your completed products to your iMovies!